I have always loved pasta, I mean, who doesn't? But for most of my life I felt guilty every time I ate pasta because I thought, as most people do, that it would make me gain weight. When I studied to become a Dietitian, I realized that carbs weren't the enemy and that pasta was fine to eat in moderation. Yet still, every time I ate pasta I couldn't simply enjoy it without the guilt! When I went plant-based a few years later and continued to educate myself, I realized that it wasn't about counting calories or grams of carbs but was really about the nutrient value of the foods you eat. Foods that are unprocessed and high in fibre and nutrients have a high satiety value and therefore not only nourish your body but also fill you up so that you are less likely to overeat and gain weight. When I started focusing on foods that had these attributes, I naturally lost weight without having to think too much about carbs and portion sizes. For the first time in my life, I felt free of guilt when I ate high carbohydrate foods and I finally learnt to enjoy pasta! 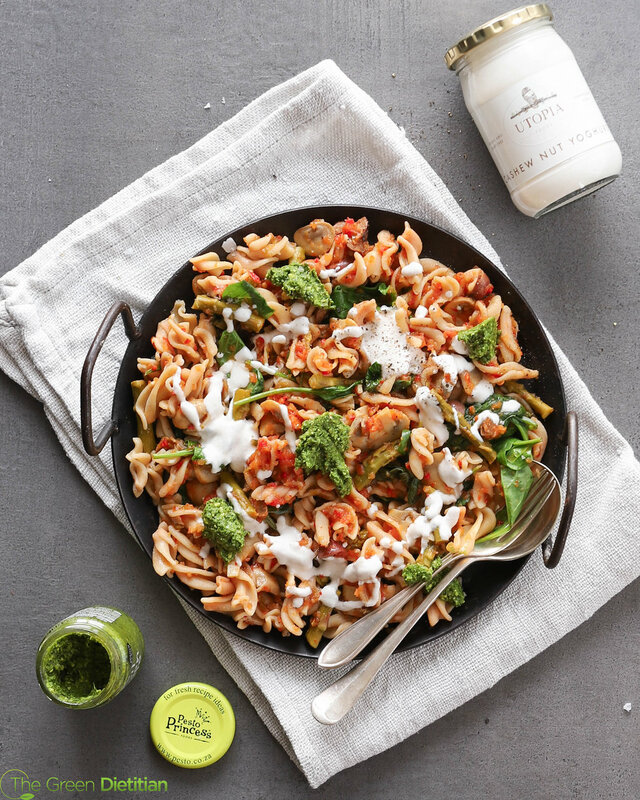 The problem with regular pasta is that it is made from white wheat flour which has been stripped of most nutrients and fibre and therefore has limited satiety value. That's why when you eat this kind of pasta you can eat a heaping plate full without getting full. So, it was at this point in my life that I learnt to really enjoy pasta without guilt but to also choose the right types of pasta. I started looking at fibre content of the pasta I bought and making sure to eat pasta that really made me feel satiated. I also made sure to combine my pasta with adequate protein, lots of veggies and healthy fats so that it made for a balanced filling meal. I created this recipe to be convenient (only one pot to clean!) and to satisfy all of those Italian pasta cravings but I also wanted it to be a tool to show you exactly how to enjoy pasta with maximum satiety so that you don't ever need to feel guilty. It includes lots of high nutrient veggies, high-fibre protein-rich pasta and enough healthy fats and is incredibly satiating. There really is no need to miss out on pasta in life or to feel deprived when you have healthy options like this. Note: If you can't get hold of the Happy Earth People pasta, brown rice/ wholewheat/ spelt/ rye/ quinoa pasta are also good options but make sure to still add some legumes into your meal for adequate protein if choosing these types of pasta. 1. Slice your peppers, onion and tomatoes into large chunks and place them in your food processor. Pulse on high until it forms a thick chunky sauce. This will be the base of your pasta sauce. Season with salt and pepper to taste. 2. In a large non-stick pot, heat your olive oil and add your crushed garlic and chopped chili. Saute on medium heat for about 2-3 minutes or until golden. If you onions and garlic start to stick to the bottom of the pot, add a splash of water to prevent burning. 3. Next add your mushrooms and a good grind of salt and pepper and saute for a further 5 minutes or until your mushrooms have begun to cook down. 4. Now add your diced asparagus spears and continue to saute for another 5 minutes. 5. Once the asparagus is sauteed, pour over your pasta sauce and add the olives and sundried tomatoes (along with a tablespoon of the vinegar). Turn the heat down to a simmer. Simmer covered for about 10 minutes, stirring every so often to prevent sticking. 6. Pour in your red lentil pasta and stir through with the sauce. Put the lid back on and simmer for another 8 minutes or until the pasta is cooked through. It should be slightly chewy. 10. Turn off the heat, add the spinach and stir through until wilted. 11. Serve with a dollop of dairy-free yoghurt and some basil pesto. Keeps in the fridge for a good 5-7 days.